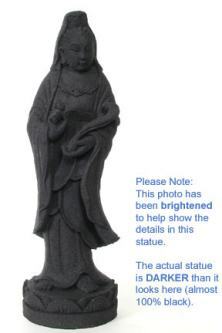 Sorry, we are currently sold out of 'Kuan Yin Statue with Stone Finish'. Please click the Wait List link below and you will be notified when it is back in stock. These Kuan Yin statues stand 13 inches tall, and have a unique stone finish. although they make look pure white, these statues are actually slightly gray in colored, and the stone finish adds serenity to the face of Kuan Yin. the material used in making this statue is known as polystone, which is a composite of resin mixed with ground stone. These are one of our best selling Kuan Yin statues, and many people give them as gifts to a friend or loved one who could use a little of Kuan Yin's compassion. The two hands lying palm up in the lap symbolize meditation and understanding; a transcendent calmness achieved through wisdom. The large pearl that is cupped in the hands is a symbol for purity; purity of thought, purity of heart. This statue has been very popular as a gift for mothers. The finish of the statue is a little too subtle to be conveyed in this pot; it is slightly spotted or speckled, almost the way that granite appears, so there is more detail than if it were just a plain white statue.